I love this comforter so much, its heavy, it's cozy and it's beautiful! Refresh your bedroom decor with the charming style of the Madison Park Nollie 3-Piece Tufted Cotton Chenille Comforter Set. Made with 100-percent cotton comforter cover, this luxurious chenille design in an all-over geometric pattern that adds a soft texture to the bedding set. The all season use comforter filling is 100-percent polyester and hypoallergenic. The matching shams perfectly coordinate with the comforter to create a classic shabby chic look. Machine washable for easy care. Disappointed in color. 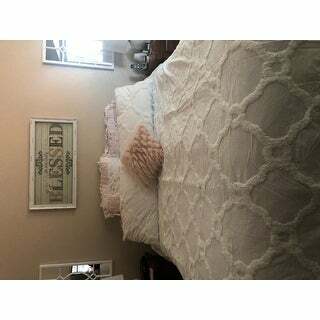 Says white but comforter is cream and shams are darker shade of cream. Comforter a bit too puffy for me, even if the color was accurate to description. Already planned bedroom around pure white linens. Sending this one back. 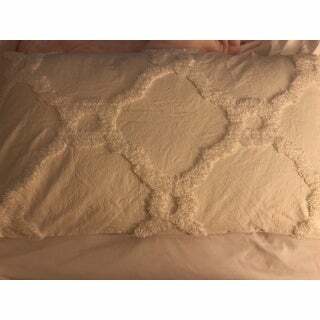 The design on this 3 piece Tufted Cotton Chenille is beautiful. It's nice and safe and gives your bed an elegant look. Very pleased with this purchase. this off white bedding is perfect for my master bedroom! The monochromatic pattern makes it look expensive. It's a comfortable weight and we are loving it so far. Its not a bright white if that is what you are looking for. This comforter is very pretty and well made. I love the soft texture to it. I would order it again. So Soft and Comfy! I love the simplicity of the design and it’s perfect in every way. The thickness of this comforter reminds me of a plush duvet. I would definitely buy this over and over again. I still can’t believe it was so reasonably priced. This comforter set is very elegant and gorgeous. No regret. Love love my bedding. My step mom birthday is coming up in November i am going to buy her one. It is a little creamer color than white and not as fluffy as I was hoping but is comfortable and looks great in my room! Did have a small stain on it when I received it. It pilled terribly after one wash. Such a bummer.